So you’ve spent all week wearing your dog out. You’ve been to the park, on long walks, and capped it all off with a muddy trip to a lake. You two have been on the go and keeping active, which is all well and good, but now it’s time to get cleaned up. That’s right the dreaded day on every doggy’s schedule. It’s… Bath Day! Don’t wash your dog too often! 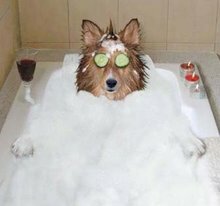 So how often should you bathe your dog? It depends on the breed; you’ll need to look up the specific information. Some dogs such as Shiba Inu’s have a waterproof coat that has natural oils which can be stripped if the dog is bathed too frequently. Give your dog plenty of exercise beforehand! You have a choice. Bathe a tired dog or a fresh and frisky one. Which seems like it might be easier? It’s best to let your dogs expend a lot of energy before bathing. That way they won’t be as vigorous in their resistance. Make it fun! Try using bubbles. It doesn’t always work, but if your dog can have fun in a lake it’s not like they associate all water with a bad time. 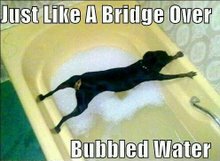 So if you bring some bubbles into the mix, you might just convince the canine that bath time is actually fun. Stay positive! Remember that dogs feed off of your emotions. If you think this is going to be fun, and choose to see it as a bonding experience with your dog then chances are they’ll follow suit. You’re the pack leader, so make your pup fall in line. These are just some basic tips that should allow you and your dog to have a very positive experience at bath time. A lot of dogs hate being cleaned. After all, they worked hard to acquire all of those bad smells. Which, by the way, they think are pretty awesome. So you’ll have to expect that there is some resistance, but if you follow these simple steps and come at the chore with a "can do" attitude, then you shouldn’t have much trouble bathing your dog. And if all else fails you can always try a mobile grooming service. Make sure to keep informed with more informative articles and advice from your friends here at Petbucket!